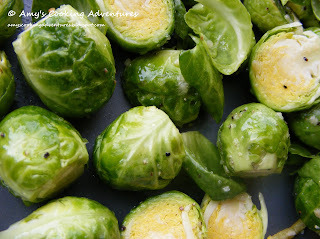 Did you know that Brussels Sprouts is plural? But most people are in a hurry and say/write Brussel Spouts, because the double plural sounds weird. Or at least it does to me, just saying. This is the first time I’ve ever made (or eaten) Brussels Sprouts, but I assure you, it won’t be the last. I decided to treat them very simply and roast them in the oven while I baked a chicken. 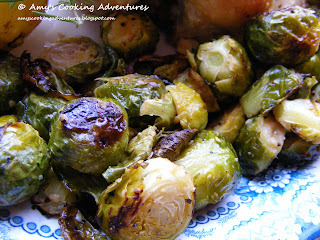 By roasting them (and cooking them with another food) it cut down on the cabbage-y smell that can come from cooking Brussels Sprouts. I’d love to say that my son ate these, unfortunately he was still down with the flu, so there was no way. However, my husband and I enjoyed them very much. Also, don't miss the updated About Amy page and the Recipe Index (updated weekly)! Trim Brussels sprouts, removing stems and any discolored leaves. Place in a zip lock bag and toss with garlic, lemon juice, and olive oil. 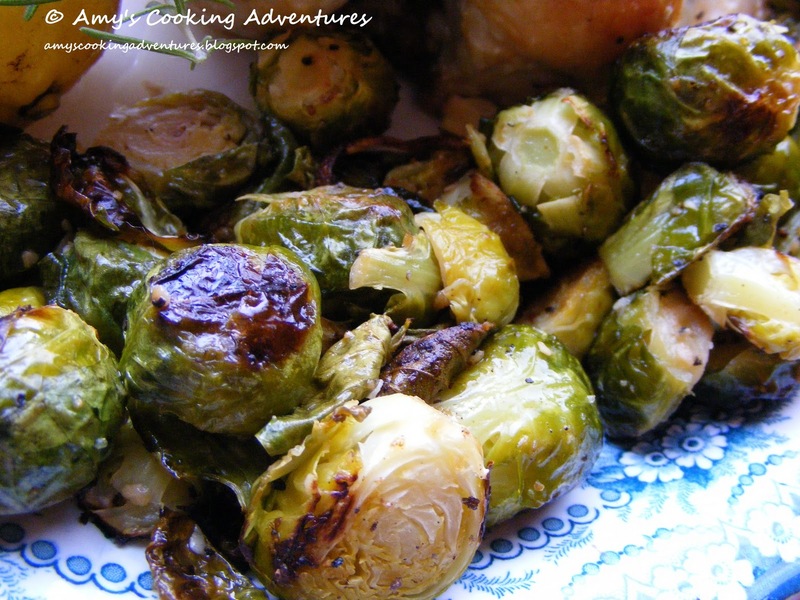 Place Brussels sprout mix in a roasting pan and sprinkle with salt & pepper. Place the Brussels sprouts on the top rack of the oven. Cook for 15 minutes and stir. Cook for another 10 minutes or until tender throughout and browned on the outside. I am the only one in the house who will eat brussels sprouts and such a shame because they are so good and good for you. Love trying new ways to cook hoping that someday I will find that perfect recipe that will get the family to try. Have roasted them a couple of times now and they are very nice done in the oven. YUM! I hope that my family will eat these. I love brussels sprouts! I can't wait to have more time to search your blog and try out your many recipes!